Prominent & Leading Wholesale Distributor from Mumbai, we offer ball spline and lm ball spline. To live up to the wide expectations of the clients, we offer the finest quality gamut of Ball Spline. Offered ball splines are manufactured under the vigilance of dexterous professionals using top quality components and sophisticated techniques. 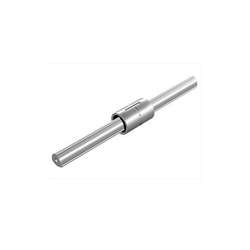 This is ideal to be used in the shaft for die setting to obtain linear motion under heavy load conditions. Due to its high strength and excellent durability, these ball splines are widely acclaimed among customers. Moreover, our prestigious clients can buy these ball splines from us at pocket-friendly rates. The raceway grooves are machined to a radius close to that of the ball elements. The large ball contact surface results in high load capacity and long travel life. 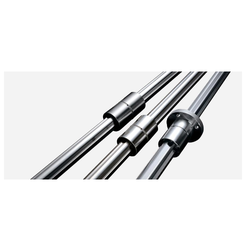 A total of 16 shafts with diameters ranging from 4mm to 100mm are available. Seven different types of nuts are available: cylindrical types (SSP/SSPM), flange types (SSPF/SSPT), and block types (SPA/SPAW/SSPB). With our immense domain expertise, we are offering the quality assured the range of LM Ball Spline that is specially designed for mechanical applications which require both linear motion and torque transmission. This ball spline is equipped with a rolling contact of the balls that eliminates backlash and reduces friction to achieve precision and reliability. Manufactured at par industry quality parameters at vendor end, and it is also rigorously tested on set qualitative parameters to ensure its optimum performance. The offered ball spline is available in various specifications as per clients needs at pocket-friendly costs. Looking for Ball Spline ?